Below are the official 2017 Hockomock League Hockey All Stars, selected by the coaches in the league. Canton, 68 vs. Middleboro, 34 – Final – Canton built a double-digit lead in the first quarter, racing out to a 17-7 lead after eight minutes. The Bulldogs extended that lead to 33-15 at halftime and then blew the game open in the third, taking a 59-26 advantage into the third. Sophomore Devin Foster had 16 points for Canton while Tony Harris had 12 points and 11 rebounds and Danny Hartnett chipped in with 12 points. North Attleboro, 59 @ Milford, 44 – Final – Samantha Taggart scored 18 points and Liz Morehouse added 12, as North Attleboro set up a winner-take-all game with Foxboro on Friday night to decide the Davenport division title. Kate Irwin scored 15 points and Nicole Dahlgren had 14 for the Hawks. North Attleboro, 4 @ King Philip, 3 – Final – Click here for a recap from this game. Mansfield, 5 @ Plymouth South, 0 – Final – Mansfield senior Matt Farragher scored his first of three goals in the first period, which turned out to be the game-winner. The Hornets added three goals in the second period, including one on the power play and one shorthanded. Mansfield added an empty netter in the third period. Mansfield senior Tony Rullo had the shutout in net. Oliver Ames, 4 vs. St. Peter Marian, 0 – Final – After a scoreless first period, OA seniors Jared Costello and Evan DiMartinis each scored a goal in the second to give the Tigers a 2-0 lead. 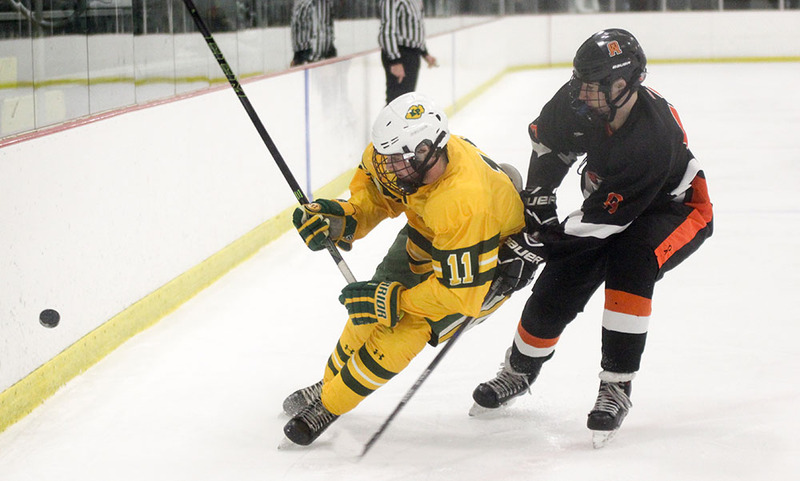 Sophomore Brett Williams netted a pair of goals in the third period to ice the game for OA. Sophomore Max Ward recorded two assists in the game and freshman Owen Connor made nine saves in net to record his first career shutout. Attleboro, 1 @ Stoughton, 2 – Final – Click here for a recap of this game. North Attleboro, 3 @ Mansfield, 3 – Final – North Attleboro took a lead three times in the game but Mansfield had an answer each time. North’s Jason McNeany put the Rocketeers up but Mansfield freshman Chris Jenkins scored an unassisted goal to tie the game. Zach McGowan put Big Red up 2-1 late in the first but the Hornets tied the game on the power play in the second, Joey Olsen converting off assists from Matt Farragher and Tyler Oakley. Drew Wissler put North ahead 3-2 but Jenkins tied the game on assists from Olsen and Farragher with 4:15 to play. Tony Rullo made 28 saves for the Hornets while Ryan Warren made 30 saves for Big Red. Oliver Ames, 5 vs. Brockton, 1 – Final – OA junior Rory Madden netted a pair of goals while junior Eric LeBlanc, senior Evan DiMartinis and senior Jared Costello each scored once for the Tigers. Sophomore Cullen Gallagher had three assists. “It was a strong team effort, a complete game from all three lines,” OA head coach Sean Bertoni said. Hockomock League Championships – Click here fore results. Taunton, 80 @ Stoughton, 61 – Final – Click here for a recap of this game. Canton, 38 @ Cohasset, 44 – Final – Junior forward Hannah Jerrier set a new career-high with 28 of the Bulldogs’ 38 points in the non-league defeat. King Philip, 38 vs. Fontbonne, 59 – Final – Click here for a recap from this game. Stoughton, 57 @ Taunton, 44 – Final – Stoughton junior Jordan Motley led the Knights with 18 points and 12 rebounds while freshman Shyanne Trinh added 16 points and junior Val Whalen finished the night with 13 points. Taunton was led by sophomore Lily Patnaude’s 14 points. Attleboro, 0 @ Oliver Ames, 1 – Final – Oliver Ames senior Jared Costello scored the lone goal in the first period and sophomore goalie Matt Mullaley made his first career start in net, turning aside 10 shots to earn the win for the Tigers. Canton, 3 @ Franklin, 2 – Final – Canton senior Tommy Kilduff scored early in the first period to give the Bulldogs the lead and then broke a 2-2 late in the third period to hand the Bulldogs two points. Bubba McNeice also scored a goal in the first period to give Canton a 2-0 lead after one. Franklin cut the deficit in half in the second period and tied the game in the third period. King Philip, 6 @ Foxboro, 1 – Final – King Philip had 11 different players register a point in the win, with five different players finding the back of the net. Junior Collin Cooke scored a pair of goals while Jacob Kelly had two assists and Gavin Maxwell had a goal and an assist. After a 1-1 first period, KP tacked on three goals in the second period and then two more in the fourth. Jack Coulter, Richie Lucente and Mitch Cormier also scored for KP while Jeremy Smith, Luke Damico, Sam Colella, Tim Hanson and Joe Boselli each had an assist. Stoughton, 0 @ Taunton, 3 – Final – Taunton’s Mike Volkmann scored twice and Cam Snead added a goal as the Tigers qualified for the state tournament for the second straight season. Canton, 3 vs. Falmouth, 0 – Final – Canton’s Colleen Kelleher made 31 saves in net to earn shut out and help the Bulldogs qualify for the state tournament. FOXBORO, Mass. – Oliver Ames erased an early deficit and held off a strong surge in the second period to pick up a 6-4 win over King Philip at the Foxboro Sports Center. The Warriors took the lead less than three minutes into the game but that seemed to spark Oliver Ames. The Tigers responded with an onslaught of offensive pressure, including three great goal scoring chances in a three minute space. OA finally broke through to score back to back goals in less than a minute to take the lead. KP freshman Kyle Gray scored his first career goal 2:34 into the game to give the Warriors the lead. After an extended possession in the offensive zone, Gray took control along the blue line and wristed a shot through traffic that found its way into the back of the net. But from that point on, it would be all Oliver Ames in the period. With 10:45 to go in the opening period, Brett Williams circled behind the net before finding Eric LeBlanc open in front for he net but his point blank shot was turned aside by KP junior goalie Shane Frommer (44 saves). With 9:15 to play, sophomore James Beatty took advantage of a miscue at the blue line by KP and race in along on goal but couldn’t get his shot past Frommer. With 8:10 left, Max Ward hit Michael Nikiciuk for a shot from the blue line that Frommer got a piece of. Frommer scrambled and was able to keep the puck from crossing with the help of senior defenseman Jeremy Smith. But on the ensuing face-off, Oliver Ames finally did cash in. Senior defenseman Jack Maloney ripped a shot that was saved, Beatty had his rebound shot saved but then was able to tuck his own rebound into the net to tie the game with 8:02 to play. The Tigers kept the pressure up, taking the lead less than a minute later. With Oliver Ames cycling through the offensive zone, the puck popped free into the middle of the ice. OA senior Michael Ziino pounced on it and fired a wrist shot that found its way under Frommer’s arm to make it 2-1. The momentum carried into the second period and it looked like Oliver Ames put the game to bed early in the middle fame. Just 49 seconds into the second, Oliver Ames made it 3-1. Williams tracked down a puck in the offensive end and fired a perfect pass across the crease to an open Beatty. Beatty stepped around the goalie and tucked it home for a quick 3-1 lead. The Tigers went on the power play following a late hit on the goal and took less than a minute to add another goal. Senior Jared Costello tracked the puck down off the side boards and took it right to goal, stuffing it in at the near post for a 4-1 lead. “We had five or six goal scorers last game against Foxboro and then had four tonight so that’s nice to see,” Bertoni said. “That was Michael Ziino’s first start of the year, we had one of our top guys out for the first period and Michael stepped up. James Beatty has been a third line guy, he got to play on the second line today and scored two goals. We’ve been waiting for him because he’s got the skill. It was nice to see him get two big goals too. Frommer denied Oliver Ames a fifth goal near the midway point of the period when LeBlanc had his breakaway chance turned aside. A minute later, KP went on the power play and took advantage. Gavin Maxwell won a face-off in the offensive zone and junior Collin Cooke connected on a cross ice pass to find Jeremy Smith at the blue line. The senior took a step in and fired a rocket top shelf to cut the deficit to two with 7:36 left in the period. OA goalie Zach Walsh made a tremendous glove save through traffic on a shot from KP freshman Joe Boselli with 3:50 to go but the Warriors kept pushing until the end of the period. After Walsh made a point black stop on a shot from Gavin Maxwell right in front with 44 seconds to go, Maxwell was able to find the back of the net with 19 seconds to play. The junior stepped in front of a clearance attempt and roofed his shot to make it 4-3 heading into the third period. But a penalty just before the end of the second meant KP started the third in a four on four situation and then, after 90 seconds, went a man down. The Warriors were able to fight off the penalty but Oliver Ames found the back of the net within a minute after going back to full strength. The puck popped free to Nikiciuk at the blue line and he fired through traffic to find the back of the net, making it 5-3. King Philip picked up back to back penalties shortly after, first a minor for tripping and then a four minute penalty for boarding, halting any thought of a comeback. OA put the game out of reach on the power play with 6:54 to go when Costello skated towards the center of the ice near the blue line and wristing a shot through a screen for the Tigers’ sixth goal. “We had a variety of scoring, we had at least one power play goal,” Bertoni said. “We’ve been practicing on just taking the puck to the net, net drives in practice and it showed tonight. It’s good to see them sacrifice and go to the net, and they might get punished, but they might get a goal out of it. King Philip added the final goal of the game with just over two minutes to play on the power play. Smith played catch with Garrett Maxwell on the blue line before the sophomore fired a shot on target. Walsh turned it aside but KP Freshman Chris Daniels was there for the tap in for his first career goal. Oliver Ames hockey (9-4-1 overall, 5-2-1 league) will take on North Attleboro in a non-league D2 showdown on Monday at 4:30 at Asiaf. 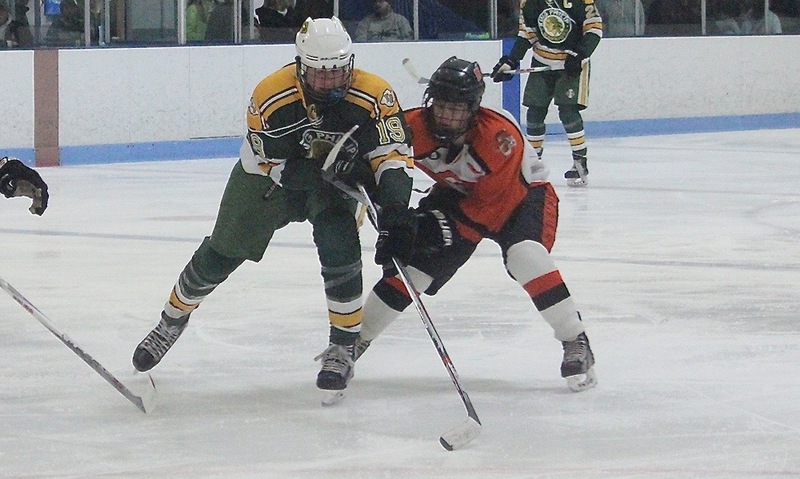 King Philip (3-12, 3-5) will be the road team in a clash with Foxboro at the Foxboro Sports Center on Wednesday. Milford, 41 @ Malden, 60 – Final – Zach Tamagni led the Scarlet Hawks with 13 points while Kayden Kelley added nine points and 10 rebounds. Oliver Ames, 56 @ Nauset, 73 – Final – Nauset held a 49-43 lead through three quarters and pulled away from the Tigers in the fourth. Nick Welch led OA with 19 points while Dylan Mahoney had 14 points and Jack Spillane added 13 points. Canton, 1 vs. Bishop Feehan, 0 – Final – Click here for a recap of the game. Foxboro, 0 @ Taunton, 6 – Final – Nick Terry had two goals and an assist for the Tigers, while Zack Albert, Cam Sneyd, and Jordan Hoey chipped in with a goal and an assist apiece and Jake Roberts had a goal. Justin Chappell had 20 saves in net for the shutout and also registered an assist. Oliver Ames, 3 vs. Plymouth South, 1 – Final – Oliver Ames’ second line had a big day on the offensive end, netting all three goals. Brett Williams scored a pair of goals and recorded an assist for the Tigers and Max Ward scored the other goal for OA and had one assist. Head coach Sean Bertoni said Zach Walsh was great in net with 22 saves while Jared Costello had a solid performance. Marshfield Quad (Franklin) – The Panthers went 4-0 at the Marshfield Super Quad. Franklin beat Duxbury 56-15, Bristol Aggie 54-15, Marshfield 36-24, and Pembroke 62-3. Plymouth South Quad (Mansfield) – The Hornets picked up a pair of wins at the quad meet. Mansfield beat Middleboro (24-9) and Carver (27-21) but fell to host Plymouth South (46-24). George Glaropolous (152) went 3-0 on the day with three pins, Antonios Sevastos (106) went 2-0, both via pins and freshman Vinnie Holmes (170) was 2-0 with one pin. Oliver Ames Quad (Oliver Ames) – The Tigers went 1-2 at the quad meet that they hosted. OA beat Plymouth North 53-30 in the opening match but lost 54-18 to Cambridge and 51-18 to BC High.